Thinly sliced cabbage salad served with CHICKEN or SHRIMP (+1.00), onions, Vietnamese cilantro, Chinese radish, julienne carrots, and marinated with a sesame lime dressing. 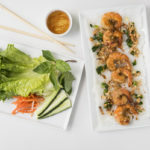 This is topped with crispy shrimp chips, cilantro, peanuts, fried shallots, and served with a side of nuoc mam dressing. Stir-fried marinated BEEF and yellow onions served on a bed of lettuce, tomatoes, and onions. 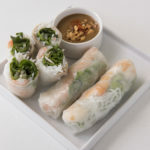 This is topped with a vinaigrette dressing and served with a side of lettuce, fresh herbs, cucumbers, Chinese radish, julienne carrots, rice papers for wrapping, and a side of nuoc mam sauce for dipping. 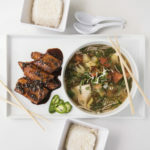 Canh Chua Ca Kho This is an exotic sweet and sour soup made with SHRIMP or FISH, bean sprouts, pineapples, tomatoes, okras, and assorted herbs in a tamarind soup base. The soup is topped with basil, cilantro, and fried shallots. This entrée comes with a large bowl of white or brown (+1.50) rice and can be accompanied with a side of medium-spicy caramelized fish served on a hot plate. Make your own lettuce wraps with steamed vermicelli rice noodle patties topped with peanuts, fried shallots, and green onions. This dish is served with a side of lettuce, fresh herbs, cucumbers, Chinese radish, and julienne carrots with a nuoc mam sauce for dipping. Steamed flat rice noodles and fried Vietnamese pork bologna topped with bean sprouts, cucumbers, basil, and fried shallots. 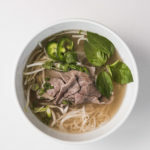 Served with a side of nuoc mam sauce. Assorted vegetables, pineapples, and tomatoes stir-fried in a VEGAN garlic sauce topped with cilantro.